Pai gow poker is an Americanised variation of the traditional pai gow Chinese gambling game – it is played with a deck of 52 cards and a Joker instead of the set of 32 Chinese dominoes used in the Chinese version of gai gow. This page will guide you through the rules of a poker game that has fast become popular within the offline and online gaming realms, and will detail why it is far more favourable to enjoy pai gow poker via the Internet as opposed to at your local land based casino venues. Pai gow poker is played with a regular deck of 52 cards plus a Joker. 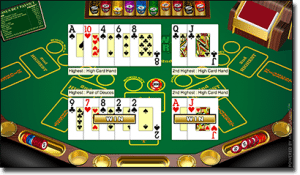 The aim of the game for the player is to beat the dealer/banker with two sets of higher ranking poker hands – a two-card hand set and a five-card hand set, as detailed below. The Joker can be used as an Ace or to complete a straight, flush or straight flush. The Joker can only be used as an Ace if used for the two-card hand. The player is dealt a total of seven cards after having placed his or her ante wager. 1. The five-card hand: The ranking system of the five-card poker hands reflect the regular poker hand rankings (Texas hold’em poker hand values). However, there are a couple of exceptions in most pai gow poker games, and that is as follows: the A-2-3-4-5 straight is the second highest straight/straight flush you can create, ranking between A-K-Q-J-10 and K-Q-J-10-9. Five Aces is the best possible five-card hand, beating a straight flush. 2. The two-card hand: The ranking system of the two-card poker hands is as follows: a pair of Aces is the best possible hand, followed by lower pairs, follower by high cards (for unpaired cards). No other combinations are possible. The five-card hand must always be of a higher ranking than the two-card hand. For example, if the two-card hand has been organised with a pair of Aces, the five-card hand would need to have a value of two-pair or better. Once organised, play continues and the player’s and dealer’s hand are compared (the two-card hands and five-card hands are ranked against each other). If both the player’s five-card hand and two-card hand beat the dealer’s corresponding hands, then the player wins 1:1 (of his or her original ante wager). If both the player’s five-card hand and two-card hand lose to the dealer’s corresponding hands, then the player loses his or her ante wager. If one of the two player hands beats the dealer’s corresponding hand, and the other player hand loses to the dealer’s corresponding hand, the game is a push (tie) and the ante wager is returned to the player. In most pai gow variants, if either hand is tied (same ranking), the dealer will win that particular hand. Outcome one: If one of the player’s hands holds the same value as the dealer’s corresponding hand, and the other player hand loses to the dealer’s other corresponding hand, the dealer will win (player loses his or her original bet). If both hands are tied, the dealer will also win. Outcome two: If one of the player’s hands holds the same value as the dealer’s corresponding hand, and the other player hand beats the dealer’s other corresponding hand, the round is a push (player has his or her original bet returned without any winnings). Once all bets have been paid out, the next round/deal can take place. Pai gow poker is available to play at land based Australian casinos such as: Melbourne and Perth’s Crown Casinos, Sydney’s The Star Casino, Gold Coast’s Jupiters Casino, the Adelaide Casino and Darwin’s Sky City Casino. For international players, it is available around in the world in casinos in Atlantic City, Las Vegas, Macau and more. These online casino sites are licensed within their respective gaming jurisdictions and are regulated by registered gaming commissions such as the U.K. Gambling Commission, the Malta Gaming Authority and Curaçao e-Gaming. Each site also undergoes regular audits by independent testing agencies and player protection and standards organisations such as eCOGRA (the eCommerce Online Gaming Regulation and Assurance body). These browser-based casino sites have also been optimised for the mobile and tablet platform, so you can play high quality and real money pai gow on your Apple, Android and Windows mobile phones and tablets. Open the links to any of our recommended websites on your portable device and you will be taken directly to the mobile gaming interface, where you can play casino favourites directly via your browser, without any software installation. Online pai gow poker: Players will be offered a wider variety of pai gow poker games when playing via the Internet, with some games featuring bonus payouts and enticing side bets. Pai gow poker games can also boast house edges as low as two per cent when best strategy is used. Sign up at All Slots Casino, deposit some money to make the most of the new player matched deposit cash bonus, and then enjoy a range of table games including pai gow, casino hold’em, Texas hold’em, craps and more.